Previous research has shown that many of the CD4 T cells from older mice do not form functional immune synapses after conjugation with peptide-pulsed APC. We now show that the defect lies at a very early stage in the cytoskeletal reorganization that precedes movement of protein kinases and their substrates to the TCR/APC interface. Antagonist peptides presented to T cells from young mice induce migration of talin (but not paxillin, vinculin, or F-actin) to the APC contact zone, but CD4 T cells from older donors typically fail to show the talin polarization response. A spreading assay in which contact with anti-CD3-coated slides induces CD4 T cells to assume a conical shape and develop lammelopodia also shows a decline with age in the proportion of T cells that can initiate cytoskeletal changes in response to this simplified stimulus. Finally, the transition from detergent-soluble to cytoskeletal forms of the p16, p21, and p23 isoforms of CD3ζ in response to CD3/CD4/CD28 cross-linking is much stronger in young than in old T cells. Thus, defects in cytoskeletal reorganization triggered by initial contact between TCR and peptide-bearing APC precede, and presumably contribute to, defective activation of protein kinase-mediated signals in the first few minutes of the activation cascade in T cells from aged mice. The kinetic segregation model of T cell activation postulates that the initial contact of a T cell with an APC involves recognition of LFA-1 and CD28 on the T cell surface by ICAM-1 and B-7.1 on the APC (for a review, see Ref. 1). This initial interaction creates the necessary proximity for the TCR to interact with peptides presented by the MHC. These first steps lead to a series of cytoskeletal reorganizations, including development of lamellopodia and molecular segregation with displacement of large glycoproteins, including CD43 and CD45, from the central area of TCR/MHC contact (2, 3). The process culminates in the formation of immunosynapses, also referred to as supramolecular activation clusters (SMAC).3 Detailed models of these processes are just starting to emerge, models in which TCR interaction with actin (4) and LFA-1 interaction with talin (5) have important roles. When the TCR encounters agonist or even antagonist peptides, LFA-1 and talin are translocated to the T cell/APC contact area, perhaps contributing to the stability necessary for the TCR to recognize the different peptides presented by the MHC. Encounters with antagonist peptides do not yield an efficient signal, and the T cell and APC become dissociated. In contrast, encounter with agonist peptides leads to signals sufficiently strong or long lasting to trigger SMAC formation (6). During the initial T cell-APC interaction leading to the formation of lamellopodia, there is a localized elevation of intracellular Ca2+ and active reorganization of the cytoskeleton, with polymerization and depolymerization of actin (7). The details of this process are not yet well characterized, and little is known as to whether other focal adhesion proteins, such as paxillin and vinculin, play key roles in immunosynapse formation. CD4+ T cells from aged mice show defects in TCR signal transduction that include deficits in serine/threonine and tyrosine phosphorylation, diminished activation of Raf-1, c-Jun N-terminal kinase, and extracellular signal-regulated kinase, and diminished elevation of intracellular Ca+, among other problems (for comprehensive review, see Ref. 8). In contrast, our experiments (9) have shown no effect of aging on the level of activation of the TCR-associated tyrosine kinase Zap-70 after CD3-CD4 stimulation in freshly isolated mouse CD4+ T cells. The contrast between the age-insensitive activation of Zap-70 and the age sensitivity of multiple downstream events led us to postulate that age-related defects in TCR-mediated activation signals are related to a lack of accessibility of the TCR-associated kinases to their substrates. Experiments using two-color confocal microscopy (10, 11, 12, 13) supported this hypothesis by showing age-dependent defects in migration of multiple substrates, including the linker for activation of T cells (LAT), Vav, Grb2, and phospholipase C (PLC)-γ, to the site of T cell/APC contact in peptide-specific and CD3-dependent conjugates. In this study, we describe a series of experiments to explore the hypothesis that age-dependent alterations in T cell cytokeletal organization and lamellopodia formation might contribute to the decline with age in the proportion of T cells that can form functional immune synapses when conjugated to stimulatory APC. Breeding pairs of the AND line of TCR transgenic mice, whose T cells respond to pigeon cytochrome c (PCC), were a generous gift from S. Swain (Trudeau Institute, Saranac Lake, NY). Transgene-positive mice were aged in a specific pathogen-free colony at the University of Michigan. Specific pathogen-free male (BALB/c × C57BL/6)F1 (CB6F1) mice were purchased from the National Aging Institute contract colonies at the Charles River Laboratories (Kingston, NJ) and at Harlan (Indianapolis, IN). Mice were given free access to food and water. Sentinel animals were examined quarterly for serological evidence of viral infection; all such tests were negative during the course of these studies. Mice that were found to have splenomegaly or macroscopically visible tumors at the time of sacrifice were not used for experiments. Mice used were at 6–8 (young) or 18–20 (old) mo of age. The CH-12 B cell line (expressing the I-Ak MHC-II and high levels of ICAM and B-7.1) was obtained from American Type Culture Collection (Manassas, VA) and maintained in RPMI with 10% FCS and 2 mM l-glutamine at 37°C and 10% CO2. Rabbit polyclonals anti-PLC-γ, c-Cbl, and CD3ζ (clone 6B10) were purchased from Santa Cruz Biotechnology (Santa Cruz, CA). Rabbit anti-Lck was purchased from Upstate Biotechnology (Lake Placid, NY). Anti-talin (clone 8, day 4) and anti-vinculin (clone hVIN-1) were purchased from Sigma-Aldrich (St. Louis, MO). Alexa-488 phalloidin was purchased from Molecular Probes (Eugene, OR). Anti-paxillin was purchased from Transduction Labs (Lexington, KY). The GST-Grb2 construct was a donation of G. Koretzky (University of Pennsylvania, Philadelphia, PA). The GST-band III construct was a gift from A. Weiss (Howard Hughes Medical Institute, San Francisco, CA). A construct encoding the cytoplasmic tail of CD3ζ was a gift of M. Exley (Beth Israel Deaconess Medical Center, Boston, MA). The GST-Grb2, GST-band III, and GST-CD3ζ fusion proteins were purified (14) and biotinylated in our lab, as described (15). Rabbit anti-CD3ζ (recognizing all phosphorylated and nonphosphorylated forms of CD3ζ) was developed in our lab using the full cytoplasmic domain of ζ-chain. Peptides were synthesized in the Protein Core Facilities of the University of Michigan. The agonist peptide sequence represents aa 88–103 of PCC (ANERADLIAYLKQATK). The antagonist peptide had the same sequence, with the exception of a single amino acid substitution (K to N) at position 99, marked in bold (16). CD4+ T cells were obtained and stimulated from transgenic or CB6F1 mice using the negative selection methods previously described (12, 17). Flow cytometry analysis of a typical preparation showed it to be 90–95% positive for both CD3 and CD4. CH-12 cells pulsed with 20 μg/ml of agonist or antagonist peptide were conjugated with CD4+ T cells, as described (11). For the two-color analyses, we first used specific rabbit or mouse Abs to cytokeletal proteins (at 1 μg/ml in PBS containing 0.2% BSA), or in some cases Alexa-488 phalloidin (at 2 U/ml in PBS/BSA), followed by biotin-GST-Grb2 (0.5 μg/ml in PBS/BSA). The slides were developed by incubation for 1 h with goat anti-rabbit or anti-mouse Fcγ Abs coupled to Alexa-488 (except for phalloidin) and then streptavidin Alexa-594 (Molecular Probes), all at 1 μg/ml in PBS/BSA. For the spreading assays, polylysine slides were incubated with anti-DNP (clone UC-8), anti-CD28 (clone 37.51), or anti-CD3 (clone 145-2C11) in PBS for 2 h at 37°C using the concentrations indicated in the text. The slides were then washed several times with PBS and prewarmed at 37°C in PBS before use. CD4+ T cells at 2 × 106 cells/ml in RPMI 1640 were then gently deposited on the Ab-coated slide, and incubated in a humidified chamber at 37°C for the times indicated in the text. The slides were fixed, permeabilized with 1% saponin in PBS for 10 min at 4°C, and stained with Alexa-488 phalloidin. After extensive washing with PBS, the slides are mounted, as described (11). The two-color analyses were performed at ×100 magnification on a Nikon Diaphot microscope equipped with a Bio-Rad MRC 600 confocal laser imaging system (Bio-Rad, Hercules, CA), as described (10). For the spreading assay, digital images for at least 100 cells/slide were recorded. The digital images were converted to TIFF files, and the area of individual cells was measured using Scion Image software (www.scioncorp.com). All slides were coded and scored blind, i.e., without knowledge of the age of the T cell donor. Approximately 10 × 106 CD4+ T cells were stimulated for 5 min by cross-linking CD3ε with CD4 and CD28, as described previously (17). The cells were lysed in 1 ml of 1% Brij-58, PBS, pH 7.4, 10 μg/ml aprotinin, 100 μg/ml leupeptin, 10 mM PMSF, and 0.1 mM sodium orthovanadate for 30 min on ice. The lysates were ultracentrifuged at 100,000 × g for 1 h at 4°C. The pellet (cytoskeleton fraction) was washed once with lysis buffer, centrifuged at 100,000 × g for 10 min, resuspended in 50 μl of SDS sample buffer, and boiled for 15 min. The CD3ζ contained in the supernatant (soluble fraction) was immunoprecipitated overnight with rabbit anti-CD3ζ chain precoupled to protein G-Sepharose. The beads were washed and then boiled for 5 min with 50 μl of SDS sample buffer. Aliquots from cytoskeleton and the CD3ζ soluble fraction were resolved in 12% polyacrylamide gel, transferred to polyvinylidene difluoride, and incubated with anti-CD3ζ mouse monoclonal (clone 6B10); the bands were visualized by chemifluorescence and quantified, as previously described (9). Unless otherwise indicated, results are presented as means ± SD of at least six young and three old subjects tested in at least three separate experiments. Statistical significance was assessed using a Mann-Whitney test at p = 0.05. We have previously used transgenic mice, whose naive CD4+ T cells are specific for a peptide derived from PCC, to show age-associated decline in T cell immunosynapse formation (11). We have now extended these studies to document the usefulness of biotin-GST-Grb2 as a single cell marker for immunosynapse formation. We chose biotin-Grb2 for this purpose based on previous demonstrations that it interacts with specific domains of Slp-76 (18), Cbl, and LAT (19), proteins that are themselves components of the SMAC. The use of biotin-GST-Grb2 also provides a technical advantage as a second color stain for confocal microscopy, in that it avoids the problems of cross-reactivity between secondary Abs used to localize other intracellular molecules of interest. Fig. 1⇓A shows digital images of T cells, conjugated with peptide-bearing CH-12 cells and then stained for GST-Grb2 as well as for PLC-γ, Lck, or the cytoskeletal proteins paxillin, vinculin, and F-actin. The top panel shows a T cell/CH-12 conjugate in which neither Grb2 nor PLC-γ has moved to the immunosynapse; double-negative cells of this kind are seen, at varying proportions as discussed below, for all pairs of stains used. The next two rows of Fig. 1⇓A show double-positive immunosynapses in which PLC-γ (or Lck) and biotin-GST-Grb2 become localized to the area of T cell-APC contact. We found very few single-positive cells, i.e., cells in which the synapse area contained either Grb2 alone or PLC-γ (or Lck) alone. Results using Abs to LAT or c-Cbl together with GST-Grb2 were similar to those for PLC-γ and Lck (not shown). For controls of the GST-Grb2 specificity, we use a biotin-GST-band III fusion protein (for a description of this construct, see Ref. 9). Under our experimental conditions, we find that the GST-band III has no detectable binding of any protein from the CD4+ T cell. These results indicate that the biotin-GST-Grb2 construct can be used to identify CD4+ T cells that have formed immunosynapses containing PLC-γ, Lck, LAT, and c-Cbl. During immunosynapse formation, there is a reorganization of the cytoskeleton characterized by polymerization of actin into F-actin filaments and accumulation of actin-related protein 2–3 (Arp2–3) at the immunosynapse (20). We therefore also examined translocation of paxillin, vinculin, and F-actin, in relation to GST-Grb2 localization. We found that all three of these molecules can move to the GST-Grb2-containing immunosynapses; results with F-actin and paxillin are shown in the bottom rows of Fig. 1⇓A. Single cell analysis of the differential localization of signaling proteins in T cell/APC immunosynapses using two-color confocal microscopy. A, CD4+ T cells from TCR transgenic mice were incubated with CH-12 cells pulsed with agonist peptide, fixed, and stained for the indicated target proteins as well as for biotin-GST-Grb2; each pair of images shows a single T cell/APC conjugate. In each case, the T cell is the smaller of the two cells illustrated. Nomarski imaging (not shown) was used to demonstrate tight conjugation of T cell to APC. The top image (a double-negative cell) is representative of conjugates in which protein migration does not occur. All other images show positive synapse responses for the proteins indicated, with the arrows showing the area of greatest concentration of fluorescent signal. B, Talin and GST-Grb2 colocalization in conjugates of transgenic T cells to APCs pulsed with antagonist peptide. 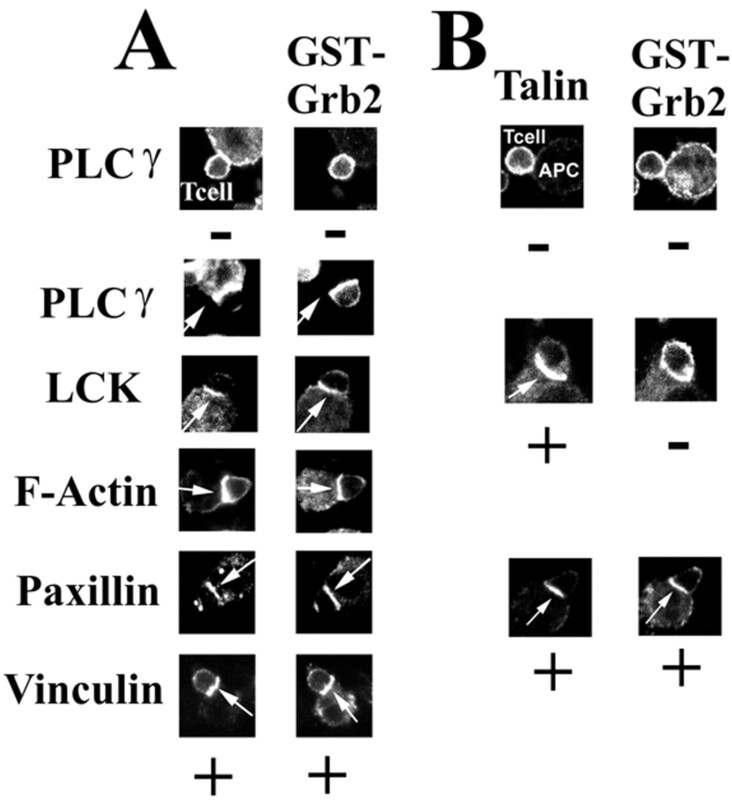 The top pair of images shows a double-negative conjugate in which the T cell has relocated neither talin nor the proteins that interact with biotin-GST-Grb2. The middle pair (+/−) shows an example of translocation of talin without the translocation of the GST-Grb2-binding proteins. The lower pair of images shows a T cell in which both talin and GST-Grb2 have moved to the immunosynapse area (+/+). Talin, another cytoskeleton protein, differs from PLC-γ, Lck, F-actin, vinculin, and paxillin in that it has been reported to move to the area of APC-T cell interaction even when antagonist peptides are used in place of agonists for stimulation (6). This translocation requires TCR/MHC interactions, but does not result in the formation of a SMAC (6). To confirm these results in our own transgenic system, we studied redistribution of talin using CH-12 cells pulsed with an antagonist peptide. Fig. 1⇑B shows typical results using Abs to talin along with GST-Grb2. We noted double-negative conjugates in which neither protein had moved to the synapse area (Fig. 1⇑B, top), others in which talin, but not GST-Grb2 had been redistributed (Fig. 1⇑B, middle), and still others (Fig. 1⇑B, bottom) in which both molecules had translocated to the immunosynapse. Conjugates in which only GST-Grb2 had moved to the synapse without talin redistribution were very rare (not shown). Using this methodology, we then quantified the percentage of transgenic CD4+ T cells from young and old mice that can produce F-actin fibrils and can redistribute focal adhesion proteins to the immunosynapses using GST-Grb2 as our indicator for synapse formation. Table I⇓ shows mean values for double-negative (−/−), single-positive (i.e., positive for the cytoskeletal proteins, but not for Grb2) (+/−), and double-positive (+/+) cells from three experiments involving six young and three old mice. Conjugates in which only GST-Grb2 had relocated, without relocation of the cytoskeletal element, represented fewer than 1% of the total in nearly all experiments and are therefore not shown in Table I⇓. Antagonist peptide, as expected, induced formation of synapses containing both talin and GST-Grb2 in only a small percentage (3–11%) of the conjugates, consistent with previous reports that antagonist peptides do not induce the formation of functional synapses containing Grb2-binding proteins. When the antagonist peptide was used, 51% of the CD4+ T cells from young mice showed talin redistribution without GST-Grb2 translocation, consistent with models in which antagonist peptides induce early, but not late stages in immunosynapse formation. In CD4+ T cells from old mice, however, only 12% of the conjugates showed talin redistribution by itself. This age effect is statistically significant at p < 0.001, and shows that T cells from old mice have a defect at a very early stage of the interaction with APCs, i.e., before the discrimination by the TCR between agonist and antagonist peptides, which leads to formation of the SMAC. Table I⇓ also shows that neither paxillin, vinculin, nor F-actin moved to the area of T cell-APC contact in responses to antagonist peptides, even in CD4+ T cells from young mice. The results suggest that the translocation of these focal adhesion proteins and detectable polymerization of actin are, unlike talin translocation, dependent on SMAC formation, or on processes triggered by agonist peptides that lead to SMAC formation. Studies using agonist peptide, also shown in Table I⇑, demonstrated that during immunosynapse formation, 61–75% of the conjugates from young donors show translocation of paxillin and vinculin and polymerization of actin in the T cell-APC contact area. In the same experiments, only 15% of the T cells from young mice are single positive for talin, and fewer than 2% are single positive for F-actin or for the other three focal adhesion proteins; thus, nearly all of the young CD4 cells that are able to relocalize the focal adhesion proteins to the synapse proceed to the stage of Grb2 relocalization as well. Consistent with our previous studies of immunosynapse formation (11), there is a far smaller proportion of CD4+ T cells from aged transgenic mice that can form immunosynapses in response to agonist-pulsed APC, ranging from 19 to 25%, depending on the specific cytoskeletal protein examined along with GST-Grb2. These age-related declines in cytoskeleton protein relocalization are statistically significant at p < 0.05. These results show that, with the exception of talin, translocation of cytoskeletal proteins to the T cell-APC contact area requires agonist peptide. Thus, the age-related defects in T cell activation include changes at early stages of TCR-APC interaction, changes that precede recruitment of other cytoskeletal elements, as well as proteins that bind to Grb2, to the APC interaction site. T cells form lamellopodia, a flattening of the contact area with the APC with a partial reorganization of the cytoskeleton, before the formation of a complete functional immune synapse (21, 22, 23). To test whether formation of lamellopodia is affected by aging, we developed an assay to study the spreading of CD4+ T cells, purified from CB6F1 mice, on slides covered with anti-CD3 Ab; slides covered with anti-CD28 or anti-DNP are used as negative controls. The upper panel of Fig. 2⇓A shows an example of a young CD4+ T cell incubated for 10 min on an anti-CD28-coated slide. The figure compiles images of the different Z planes of a single cell, stained with phalloidin to show F-actin. In this cell, F-actin is distributed uniformly around the cell periphery from the top of the cell (left part of the series) to the area in which the cell is in contact with the anti-CD28 on the surface of the glass slide. Identical results are found using anti-DNP-coated slides (not shown). In contrast, cells incubated on slides covered with anti-CD3 typically spread and acquire a conical shape, as illustrated in the bottom panel of Fig. 2⇓A. The Z plane of contact with the anti-CD3 (the rightmost Z plane section in the series) shows high levels of polymerized actin localized as a ring at the edge of the cell, with a central area containing lower levels of F-actin. The T cell shape and F-actin redistribution and cytoskeleton reorganization are similar to alterations previously seen in T cells conjugated to APC (24, 25), although the SMAC is not formed in such slide-adherence cultures (24). Fig. 2⇓B shows typical digital images of CD4+ cells from young or old mice obtained from the contact zone using anti-DNP-, anti-CD28-, or anti-CD3-coated slides. As expected, CD4+ T cells from young mice generate contact zones that are round and relatively small when the slides are coated with anti-DNP or anti-CD28. Contact zones of CD4+ T cells from old mice are similarly round and homogeneous, but for unknown reasons are typically somewhat larger than those produced by T cells from young donors. Incubation on anti-CD3-coated slides induces in young CD4 cells a larger contact zone characterized by a bright ring and an inner zone of diminished phalloidin-staining intensity. CD4+ T cells from old mice, incubated on anti-CD3 slides, fall into two classes. Some cells show with no detectable spreading (similar to images seen on anti-CD28), but others closely resemble T cells from young mice on anti-CD3 (see arrows in Fig. 2⇓B for contrasting examples). Spreading assay using CD4+ T cells. CD4+ T cells from young and old CB6F1 mice were incubated for 10 min on slides covered with anti-DNP, anti-CD28, or anti-CD3. The cells were fixed, stained with phalloidin, and analyzed by confocal microscopy. A, Shows a montage of images through successive Z planes from single T cells adherent to slides coated either with anti-CD28 (top) or anti-CD3 (bottom). The anti-CD3-binding cell shows induction of spreading, an overall conical shape, and a ring of F-actin at the periphery of the T cell in the sections in which the cell is in contact with the slide. B, Shows a wider field at the Z plane level at which the T cells, from young or old donors, are in contact with slides coated with anti-DNP, anti-CD28, or anti-CD3. The arrows in the lower right panel of B indicate two types of cells from old mice, one (upper arrow) resembling young cells stimulated by anti-CD3, and the other (lower arrow) resembling old cells exposed to the control Abs anti-CD28 and anti-DNP. C, Shows typical frequency distributions for T cells of different size classes (from 1 to 6 U of area), in which the measurement reflects the area of the cell in its contact zone (Z plane) with the coated slide, normalized by setting the mean area of one of the two young CD28-exposed CD4 cells per experiment to 1 arbitrary area unit. □, Young cells, CD28; ▪, young cells, CD3; ○, old cells, CD28; •, old cells, CD3. We used an image analysis program to estimate the proportion of CD4+ T cells from young and old mice that respond in this anti-CD3-spreading assay. The procedure measured the area of the contact zone for at least 100 cells of each type in each experiment; the raw data were normalized so that the mean area of responses to anti-CD28 was set to 1.0 U for the first young mouse tested within each experiment. Fig. 2⇑C shows a representative result, comparing cells from one young and one old CB6F1 mouse. T cells from the old mice incubated on anti-CD28 slides (○) have slightly larger contact zones compared with T cells from young donors (□), i.e., 1.8 arbitrary units (SD = 0.8). When T cells from young mice are incubated with anti-CD3 (▪), the mean area increases from 1 to 3.2 ± 0.7. The mean value for old T cells on anti-CD3 slides increases only slightly, i.e., from 1.8 to 2.2 ± 0.9 U (•). The distribution of cell areas for the anti-CD3-treated old CD4+ cells is much broader than that seen for young CD4+ cells, and there is substantial overlap with the distribution of areas seen in the anti-CD28 control condition. We interpreted this distribution of old CD4 cells as a composite of two overlapping populations, one that responds slightly, if at all, to anti-CD3 contact, and a second that can spread nearly as well as T cells from young mice. We also performed this spreading assay using CD4+ T cells from the transgenic mice. The anti-CD3 induced a 3.5 ± 0.2 (mean ± SD)-fold induction of spreading in T cells from the young mice, but only a 2.1 ± 0.2-fold induction in T cells from the old mice. We also noted a bimodal distribution, including some responsive and some nonresponsive cells, in T cells from the aged transgenic mice, similar to that seen in experiments with CB6F1 mice (data not shown). It has been reported that PMA-induced increases in the mobility of membrane LFA-1 reflect partial cytoskeleton reorganization and release of LFA-1 from the cytoskeleton matrix as a result of protein kinase C activation or increases in membrane fluidity (26). To test the hypothesis that age-related defects in cytoskeleton reorganization can be overridden by pharmacological agents, we treated T cells from young and old with 5 nM of PMA for 10 min and then performed the spreading assay, as described above. The results of three separate experiments showed no significant differences in the frequency distribution between young and old after PMA treatment (data not shown). The result suggests that cytoskeleton rearrangement in the old CD4+ T can be triggered by CD3 in the presence of low doses of PMA. Table II⇓ shows the results of a more comprehensive analysis, using two concentrations of anti-CD28 or anti-CD3 (20 and 2 μg/ml) and two different incubation times (10 and 20 min) for CB6F1 mice, and using a single dose and time for cells from transgenic mice. Because before stimulation the cells from the old CB6F1 mice are larger than those of young donors, for these mice we used two criteria for a positive response, one set at a level exceeded by only 5% in the first of the two young mice used on CD28 slides in each experiment, and the other, higher, criterion set at a level exceeded by only 5% of the old cells on CD28 slides in the same experiment. As suggested by Fig. 2⇑, CD4+ T cells from the old CB6F1 mice were indeed slightly larger than young cells on control slides with anti-CD28; for the 10-min incubation at high Ab dose, for example, 42% of the old cells exceeded the cutoff area value, compared with only 7% of the cells from young mice. A 10-min incubation on anti-CD3-coated slides induced 98% of the young cells to spread out to an area above the criterion (7% background), but only 76% of the old cells (despite their higher, 42% background value). On the control slides coated with anti-CD28, there was no difference in spreading between young and old transgenic mice (with 5% of cells about threshold for both genotypes), consistent with the idea that the difference in the size of unstimulated CB6F1 cells might reflect the age-dependent increase in memory T cells, which is much less dramatic in transgenic mice. A total of 96–97% of the cells from young transgenic mice spread onto anti-CD3-coated slides, compared with only 49–52% of cells from old transgenic mice, showing that the age-dependent decline in spreading responses is not limited to CB6F1 animals. Qualitatively similar results were seen at each Ab concentration and each time point using the CB6F1 animal model, and regardless of whether the arbitrary threshold was set based on young or old CD28-binding cells. When the criterion for response was based instead on the 95% cutoff for unstimulated old T cells, no more than 30% of the old CD4+ cells can be scored as responsive. The age-related declines are in all cases statistically significant (at p < 0.05) when compared with young for the same time of stimulation. Taken together, the data in Table II⇑ show that 70–98% of the CD4+ T cells from young mice can produce lamellopodia and spread out onto anti-CD3-coated slides, but that only 17–30% of the T cells from old mice can trigger a detectable membrane flattening when compared with the responses of old cells to control slides coated with anti-CD28 in the same experiments. The lack of T cell response cannot be attributed to the shift between the naive to memory phenotype, because the T cells from old transgenic mice remain in naive state (11) and show similar decline in the spreading assay. The lack of talin redistribution and lamellopodia formation in CD4+ T cells from the old mice could be the result of age-related changes in the interactions between cytoskeleton and the TCR complex. Age-related changes in CD3ζ association with the cytoskeleton could limit the initial cytoskeleton reorganization and decrease the amount of TCR translocated to the immunosynapse. To test this hypothesis, we stimulated CD4+ T cells purified from spleen of CB6F1 mice, by cross-linking the TCR with CD4 and CD28, and then separated the proteins associated with the cytoskeleton matrix (cytoskeletal fraction) from the proteins in the detergent-soluble fraction, which includes proteins from both membrane and cytosolic compartments. 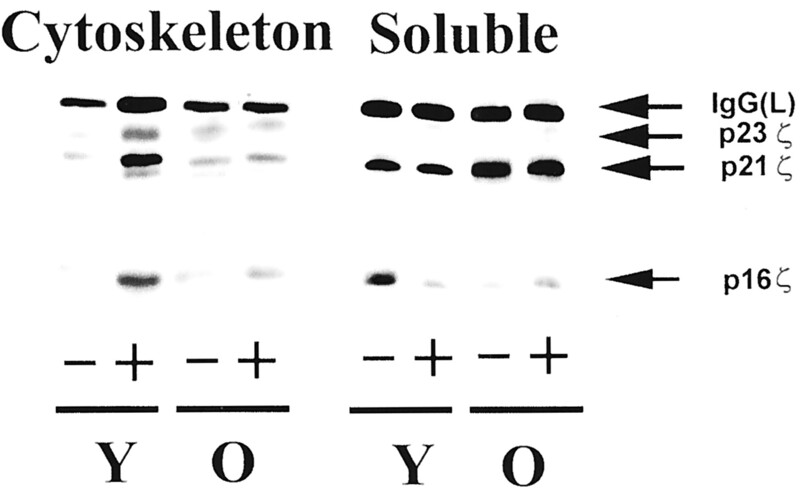 The purity of the cytoskeletal fraction was evaluated by Western blots showing that Raf-1 and ribosomal S6 protein kinase were found in the soluble fraction, but not in the cytoskeleton preparation (data not shown). Fig. 3⇓ shows CD3ζ Western blots for the cytoskeleton and soluble fractions purified from young and old CD4+ T cells. Three predominant ζ forms can be detected; p16ζ and p21ζ, both in the cytoskeleton and soluble fractions, and p23ζ, detected only in the cytoskeleton fractions. These results are similar to previous observations using T cell lines (4). Fig. 3⇓ illustrates effects of donor age and of stimulation, which we quantitated and show in Table III⇓ as mean values from five individual mice of each age. Anti-CD3ζ Western blots showing CD3ζ forms associated with the cytoskeleton or the detergent-soluble fraction of CD4+ T cells from young and old mice. CD4+ T cells from young and old mice were stimulated (+) or not stimulated (−) by anti-CD3 cross-linked with CD4 and CD28. The cytoskeleton and soluble fractions were purified, and the CD3ζ forms of the soluble fraction were immunoprecipitated and compared with cytoskeleton-associated proteins using anti-CD3 Western blots. The arrows indicate the three major CD3ζ forms present. Even before stimulation, there is a difference between young and old CD4+ cells in the distribution of CD3ζ molecules: a shift from the p16 form to the p21 form in the soluble fraction. CD4+ T cells from old mice have 2-fold lower levels of p16ζ (p = 0.02) and almost 2-fold higher levels of p21ζ in the soluble fraction (p = 0.04), compared with T cells from young donors. Activation induces changes in the distribution of all three forms of CD3ζ in T cells of young mice. After 5 min of activation, T cells from young mice show increases in the amount of p16ζ, p21ζ, and p23ζ associated with the cytoskeleton, and corresponding declines in the levels of p16ζ and p21ζ in the soluble fraction; each of these changes is statistically significant at p < 0.05. These translocations from the soluble fraction to the cytoskeleton were, however, not detected after activation of CD4+ T cells from old mice. These results show that aging inhibits the translocation of CD3ζ from the detergent-soluble fraction to the cytoskeletal matrix. Such a change might constrain the movement of TCR complexes to the immunosynapse by interfering with the ability of TCR complexes to flow within plasma membrane domains to the site of APC contact. Two experiments of this kind were conducted using purified CD4+ T cells from four young and two old transgenic mice (data not shown). The CD4+ T cells from the young transgenic mice showed a 2.5-fold induction in p16 translocation to the cytoskeleton (mean 1.0 ± 0.2 SD in resting cells, compared with 2.5 ± 0.5 after CD3 stimulation), with a corresponding decline in p16 content in the soluble fraction (2.1 ± 0.3 in resting cells compared with 1.1 ± 0.3 after CD3 stimulation). In contrast, there were no significant changes in distribution of p16 in CD4+ T cells from the old transgenic donors. The segregation model of T cell activation proposes that the initial T cell-APC contact takes place through the interaction of accessory molecules such as LFA-1 and CD28, followed by displacement from the contact area of large glycosylated proteins, such as CD45 and CD43, that could interfere with TCR-MHC interaction (for review, see Ref. 1). In the next phase, TCR recognition of agonist peptide stabilizes the T cell-APC interaction and initiates a process that leads to the formation of the SMAC. According to this model, MHC molecules bearing antagonist peptides can during this phase induce the translocation of focal adhesion molecules such as talin to the T cell-APC contact area, but not induce formation of functional immunosynapses containing protein kinase C-θ and other signal-coupling elements. Our current results are consistent with this model, in that both antagonist and agonist peptides induced the translocation of talin to the T cell-APC contact area (see Fig. 1⇑B), while only agonist peptide can trigger the translocation of several TCR-associated proteins and formation of the SMAC (11). To study the relation between the immunosynapse and proteins belonging to the focal adhesion family, we have analyzed the localization of paxillin and vinculin with respect to SMAC formation. We selected paxillin and vinculin because these have been reported to associate, respectively, with talin and LFA-1 (for a review, see Ref. 27). In addition, paxillin can associate to Src homology 2 domains of the Src family of tyrosine kinases (27). As shown in Table I⇑, agonist peptides can trigger the translocation of these proteins to the immunosynapse in 60–75% of the young naive CD4+ T cells conjugated to agonist-bearing CH-12 APC. The results suggest that these focal adhesion molecules play a role in immunosynapse formation, although further studies will be needed to determine whether blocking of their translocation abrogates the formation of SMACs. When we analyzed naive CD4+ T cells from old mice, only ∼20% of the cells show this pattern of translocation of cytoskeletal proteins to the APC contact area, consistent with our previous work (11) showing age-related defects in movement of many kinases and substrates to the SMAC in aged T cells. Our observations of talin translocation suggest that age-related changes in reorganization of the cytoskeleton may be a cause, rather than merely a consequence, of defects in SMAC formation. When redistribution was analyzed using an antagonist peptide, 62% of young CD4 cells, but only 15% of old CD4 cells, were able to relocate talin to the area of APC contact. Thus, the lack of talin translocation in the naive CD4+ T cells from old mice suggests age-related defects in the initial TCR-APC interactions before recruitment of other elements of the SMAC. The kinetic segregation model of TCR signal transduction suggests several possibilities that could explain defects early in the interaction between TCR and APC, including not only alterations in cytoskeleton reorganization, but also potentially changes in TCR-MHC-II interaction caused by negative regulators such as CD43 (28) or other large glycoproteins (29), or a decline in the calcium signal in the initial T cell-APC contact area. To evaluate these ideas, we used a simplified system in which the APC surface was replaced by glass slides coated with stimulatory (anti-CD3) or nonstimulatory (anti-CD28 or anti-DNP) Abs, and in which T cell cytoskeletal changes were monitored by evaluating lamellopodia formation. This system has been shown previously to mimic, in part, the initial TCR-APC interaction by inducing a TCR-dependent cytoskeleton reorganization, localized calcium flux, and flattening of the T cell membrane without formation of immunosynapses (24). Using this system (Fig. 2⇑ and Table II⇑), we noted that anti-CD3 induces spreading of CD4+ T cells, which acquire a conical shape that resembles T cells adhering to authentic APC (see Fig. 1⇑ for examples), and triggers a limited reorganization of the cytoskeleton including an F-actin ring localized in the area of the T cell periphery that is in contact with the slide (Fig. 2⇑). Anti-CD3 induces this spreading response in 70–90% of the CD4+ T cells from young mice, but only 17–31% of the CD4+ T cells from old CB6F1 mice. The response of transgenic T cells in the spreading system also declines by ∼50% in old age. We hypothesized that this age-related change in cytoskeletal responsiveness might reflect underlying changes in interactions between proteins of the TCR/CD3 complex and proteins responsible for cytoskeletal structure. Previous work has shown that different CD3ζ forms are associated with different fractions of the T cell membrane (4). Some, including p23ζ, are anchored to the cytoskeletal matrix, while other forms of CD3ζ remain relatively free of cytoskeleton interaction in resting cells. After TCR engagement, however, all isoforms of CD3ζ are translocated from the soluble fraction to the cytoskeletal matrix, as illustrated for young CD4 cells in Fig. 3⇑. Our data show that aging alters the pattern of CD3ζ distribution in both resting and activated cells. In the resting cells, there seems with age to be a replacement of p16ζ by p21ζ in the soluble fraction, and after activation there is an age-related decline in the extent to which all three forms of CD3ζ translocate to the cytoskeletal fraction. These shifts could affect the migration of the T cell protein kinase Zap-70 to the SMAC, because there is evidence that Zap-70 does not bind to p16ζ (4), but does associate with p21ζ and p23ζ (30, 31, 32, 33). This differential Zap-70 association, along with the age-related increase in p21ζ levels, could potentially explain our previous observation of higher levels of Zap-70 associated to TCR complex in CD4+ T cells from old mice (9). The age-related decline in TCR-stimulated translocation to the cytoskeleton of all forms of CD3ζ is consistent with, and may prove to account for, our previous report of defects in translocation of Lck and c-Cbl to the SMAC in CD4 T cells of age TCR transgenic mice (11). In addition, we have unpublished data to show age-related defects in the translocation of Lck and c-Cbl from the soluble to the cytoskeletal fraction in activated CD4 cells (not shown). All three approaches, synapse analysis, spreading, and immunoprecipitation, reveal age-related changes in T cells from TCR transgenic mice, making it unlikely that our results can be explained by the age-related shift from naive to memory T cells, which is greatly inhibited in the transgenic model. Thus, each of these results supports the notion of an age-related change in interaction of the cytoskeleton with components of the TCR complex, at least in naive CD4+ T cells. 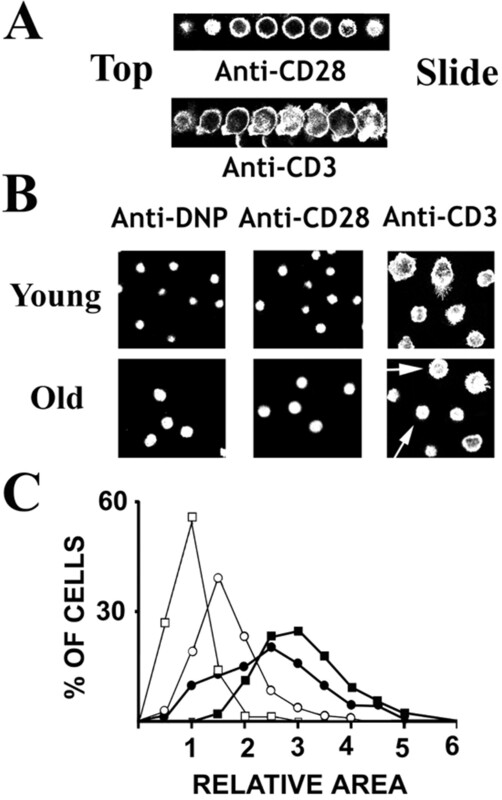 We do not know whether the age-related changes in the association of CD3ζ isoforms with the cytoskeleton are the sole explanation for the signal transduction defects in aged naive CD4 cells. The TCR segregation model suggests other possibilities, including potentially alterations in interaction of TCR or other T cell surface molecules with APC proteins caused by interferences mediated by large proteins such as CD43 and CD45. Further studies will need to be performed to differentiate among these and other mechanistic hypotheses. ↵1 This work was supported by National Institutes of Health Grants AG19619 and Core Grants AG13283 and AG08808. ↵3 Abbreviations used in this paper: SMAC, supramolecular activation cluster; LAT, linker for activation of T cells; PCC, pigeon cytochrome c; PLC, phospholipase C.